Each person can freely let their light shine, allowing their ideas and creations to brighten the lives of others near and far. People who enjoy a creation can support the creators financially without spending any money. The people of the planet can come together, without the need for artificial borders or elected officials, to decide what should be done in their communities. Democracy has re-emerged for the 21st century, allowing the people of the planet a joyful transition into a lighter world of love and abundance. 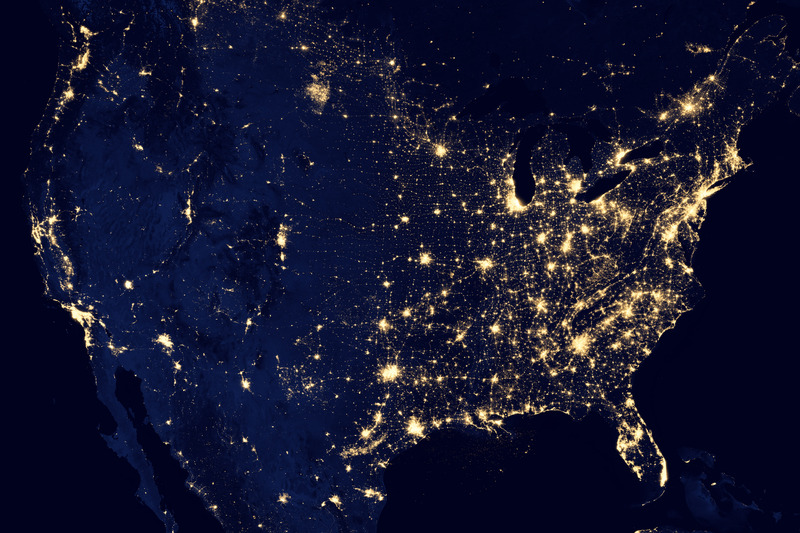 In this NASA image, you can see the fractal distribution of population. Fractal geometry organizes the natural world. This is the first time a global-scale fractal information distribution system has ever been implemented, or even proposed. This is not just a major event for technology, it is a major event for the human species. With so much energy in the world in the form of information, chaos will always ensue until a fractal architecture can be achieved. This is the fractal architecture that the world needs to manage so much information. By empowering creators of music, we, the people, get to decide collectively and democratically what is entering the mass consciousness at any time. As we advance in our collectiveness and understanding of collective consciousness, the masses will be able to vote good vibrations into the ears and minds of the masses. We know that humans are essentially love, and that music unlocks a bit of the hidden love inside. We believe that good music is being held up by the traditional system, and therefore so is the true human nature, the nature of consciousness. We know that by freeing the music we can free the minds and souls of the people of Earth, and show the youth that they can express themselves freely. cXc Media is the extension of cXc Music into all fields of creative expression, including cXc Music, cXc Video, cXc Lit (Literature, including Poetry, Opinions, Fiction, Nonfiction, Drama), cXc Art (including Photos, Illustrations, Installations, 3d Models, Crafts), cXc News, and cXc Games. We know this will catalyze a global sharing of ideas, customs, art, and understanding. Through cXc Media, we will break down all remaining cultural walls. Once every child of the world can see that his fellow human across the world is his brother, and we are all a unique expression of the same one, we have a big shot at worldwide peace and having pretty awesome society. As cXc Media becomes more integrated, it will replace traditional forms of media. Only the old folks will still watch TV. Kids and young adults would rather go on the map and find content, because it is a better system, because they have a vote, because they have their work on the map, and because its cool. By this time, third-party integrations will allow the creations posted on cXc Media to have their own life, and posting a piece of art once will allow it to be sold on multiple sites, allowing the artists to eat. cXc Media will work with all sorts of devices, giving everyone people-curated alternative to news, radio, and more. cXc Solutions focuses attention on solutions and solution generation. On cXc Solutions, known problems are a filter (like Genre on cXc Music) and solutions show up on the map instead of media. These solutions are voted on, and then can be implemented in real life. Around the world, different cultures can look to other places with similar problems and see what solutions are working for them. Together we can share in creating a healthier, smarter, happier, and more eco-logical world to live. cXc ideas is a collaborative tool for ideas of any kind. Users can co-create realities using ideas freely shared on the app. Votes allow these ideas to be broadcast wider and brighter, attracting more eyes, ensuring the most motivated people can find each other and manifest these ideas. Idea ownership is a cultural belief, not a fact. cXc Ideas offers a chance to look at ideas in a different way, as vibrations floating through the universe that we tune into with the fractal antennae in our brain. We can share these ideas and help them to grow together. This tool is a quantum leap for creators. If someone truly wants to make something real they can share it it can be broadcast to the whole world. This can help their idea be manifest without them working on it, and without being responsible for it, if it is chosen by voters. cXc Pueblo is our greatest social experiment, something that will change the workings of society as we know it. cXc Pueblo is like cXc Solutions in that people can vote on solutions, but in cXc Pueblo, a city (or other group of people) can vote on issues that directly affect them. cXc also works like cXc Solutions in that any other city can see how other cities are solving problems, what they are voting on and more to get ideas to better citizen’s lives. Any citizen can post a proposal. This proposal can then go on to get votes. Each municipality can set their own rules for the Mapp, including time restricted votes, voting for one proposal or another, limits on who can vote, minimum votes to pass, and set administrators to the system. The goal with cXc Pueblo is to re-invent governing for the new world. Periodically, a major shift happens in governing because of the failure of the last system. We want to make this system ready for when we say “enough is enough” to the one we have. By improving the energetic connection of all people, and allowing this connection between minds to manifest through media, community involvement, and more, we hope to raise the consciousness of the every person towards that of love. The evolution of consciousness is always happening, and through evolving together we get there quicker and more joyously. This is the beginning of empowerment. First, we must make the public accustomed to having their voice heard, to being able to launch their dreams and the dreams of those they believe in. By showing the individual their voice is important and they can make a change, we begin to empower each person to become the change they wish for the world. Through empowering the artists, we are placing our bets on the ability of these individuals to hone harmonizing energies for the planet. Once we expand to all forms of art and creation, the amount we empower creators will allow the brightest seeds on Earth to shine, destroying fear, illusions, and darkness. These bright seeds will change how society functions and thinks in ways we cannot imagine. After cXc Media Suite is launched, cXc Solutions will be launched. cXc Solutions will allow anyone to post and vote on solutions for the world to see. cXc Ideas will go along with this, offering people the ability to manifest their ideas by sharing them openly, accepting support from around the globe. By empowering existing municipalities and giving the tools to anyone who wants to create a community, we are empowering movers and shakers to create social change through cXc Pueblo. This phase is shaking the foundations of what we believe a society is, as the few in power become the many in power, and each citizen has the same power as the lawmaker. Everyone have to power to create, change, and overturn laws and proposals. Through fractalizing the geometry of information transfer we allow a framework for a unified world to develop. Systems of information transfer must exhibit this fractal geometry to resonate with the fractal geometry of the universe, and of consciousness itself. By creating the framework for this fractal transfer of information through Mapps, a unified world can exist through the uniqueness of each part. Each part will benefit and benefit from every other part, growing together as a planet and as a universal consciousness.